This is a recipe that I love because it is so versatile and can be made ahead (and is even better if it has some time to sit in the freezer.) 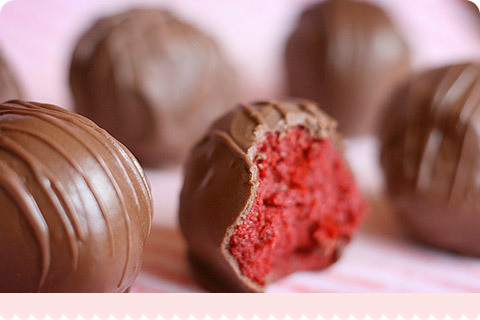 You can use any type of cake and frosting, any type of chocolate, and any topping to make dozens of different cake balls! Make the box cake mix as directed. Let the cake cool. Crumble up the cake completely and add in 3-6 Tbsp of icing. Mash the cake together (it will be like putty but you have to mash all of it together with no crumbs.) Roll out small balls about 1 inch each. If you have time, put in the freezer for at least an hour (or even up to a few weeks.) You can skip this step and they will be just as delicious, but not quite as pretty. melt the chocolate in a double boiler. Dip the cake balls (do not thaw before dipping.) Place the balls on wax paper to cool. You can top with a topping or drizzle chocolate over the top, or just leave plain. You can put these back in the freezer for up for to a few days, or you can eat as soon as they cool.